The first TV Spot for Star Wars: The Force Awakens premiered on South Korean television and was posted to the official YouTube channel. 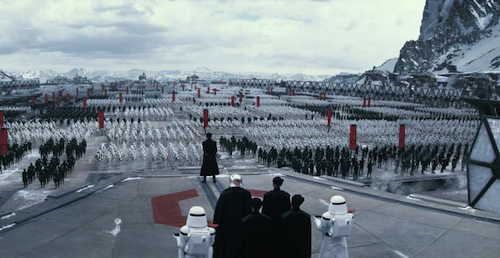 New footage depicts a rally of The First Order, featuring Captain Phasma and Stormtroopers, followed by a montage taken from the first two teaser trailers. This weekend's D23 Expo, a Comic-Con for Disney aficionados, may see further footage from the highly-anticipated seventh movie in the Star Wars franchise.